Summary: Fintechs like Square and PayPal have been successfully wooing merchants to use their credit and debit card payment processing systems. What can you do to fight back? In a good news story, Bloomberg is reporting that the Great Barrier Reef is now showing signs of recovery, following a mass coral bleaching back in 2016. A milder summer along with huge coordination among public and private enterprises has apparently turned the tide on this issue. 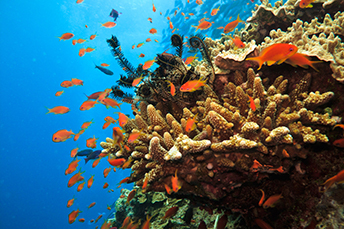 For our scuba diver readers and ocean lovers, this is refreshingly good news. Many community bankers we know now feel refreshed and in full recovery mode too following such strong economic activity. That said, many also say they continue to struggle in the battle vs. the fintechs. For some time now, fintechs like Square and PayPal have been successfully wooing merchants to use their credit and debit card payment processing systems. For a while, most bankers weren't too concerned, because many of these tiny mom and pops were considered too small to be able to utilize merchant banking services in an appreciable way to be profitable for the bank. Over time though, things have changed, as these fintechs have added more services to help merchants better manage their operations. As a result, these fintechs have been able to move up market and lure slightly larger merchants. Things have become so competitive, in fact, that Wells Fargo recently simplified its merchant services pricing structure to be more like Square. It also said that fintechs were, indeed, encroaching upon its business. Wells Fargo now provides small business process payments for a fee of 2.6%, and an additional 15 cents for each tap, dip or swipe card payment. For keyed-in transactions it charges a fee of 3.45%, plus 15 cents for each transaction. This fee structure is now more similar to the fintechs' pricing structures vs. the traditional - and more complex -- table-based fee structure that most banks still charge small business merchants. Do a competitive review. Things change in the market so you have to stay on top of that. When new fees or offerings appear on the scene, see how yours stack up against them. Highlight the ones that make you shine and make improvements on others, if needed, to stay competitive. You don't want to react to every change, but you don't want to be out of the running either. Stay informed. It never hurts to know what the big guys, including the fintechs, are doing. Your customers are most likely aware of their latest offerings, so you want to be prepared for any discussions based on the competitive landscape. Stick to your roots. Remember that your community counts on you. Keep building relationships and finding new ways to help local businesses and keep your eyes open as you do. The personal touch is still important to business customers, but don't get complacent either. Things can happen fast in this industry. According to Bank Director, bank executives stated their top three compensation challenges for 2018 are: managing compensation and benefit costs (44%); tying compensation to performance (40%) and succession planning for CEO/executives (37%). A NetDiligence study of claims submitted to insurance companies for cyber reasons finds the most common sources of breaches were hackers (27%), malware and viruses (16%), stolen or lost devices (12%), employee errors (10%), paper records (9%) and rogue employees (8%). A Clearing House survey finds 51% of consumers who use nonbank fintech apps say they would give their credentials if it was necessary for the app to access data and 44% said they would do so for a more seamless user experience.